Those of you who have followed Reduce Footprints for some time might remember Elizabeth Barrette who was a regular participant in the Change The World Wednesday challenges. We haven't seen Elizabeth in awhile because she's been busy writing. She's recently published two wonderful books: From Nature's Patient Hands: A Collection of Poetry and Prismatica: Science Fiction Poetry Spanning the Spectrum. I have had the pleasure of reading both books and I can tell you that they are beautiful. Elizabeth has the ability to paint pictures with her words. She has graciously agreed to talk to us today about our connection to nature and how she chooses to share nature's voice. Whenever I go outside, the world speaks to me. Its voice is there in the rattle of wind through autumn cornfields, in the crackle of flames crawling over logs, in the bright trill of birdsong. Nostalgia is the lazy drone of a cicada on a summer afternoon; humor is the gurgling chuckle of a stream. Patience is the sound of silence: Be still. Wait. There is more to come. I have spent my life learning to listen to nature. I know the sound of toads calling for their mates, of coyotes singing to mark their territory. I know how the alarm-call of birds when a predator moves by differs from the calls they make when I go to refill the bird feeders. The sounds tell me what's going on around me, in what they say and do not say. Beneath the sounds there lies a deeper voice. This planet is alive and alert, although it does not think the same way we do. In a sense, humans are the part of the Earth that thinks consciously, that reasons, that plans ahead. Yet the living planet has a mind of its own, and it speaks; and because we belong to it, we can hear it, if we learn to listen. The messages are there for anyone who attends to the tongues of trees, the brook-written books, and the slow sermons of stone. These are the voices in my nature poetry. I give you the sounds of the wilderness, the same way I describe the sights and the smells and the other details, to anchor you in a particular place. I give you the clues to reveal what happens, so that you can put it together just as you would if you stood in the place I described. The joy of language is there -- simile and metaphor, rhythm and rhyme -- drawn out of the human brain's gift for linguistics. The last voice lies between the lines, rarely overt, the deep meaning of what nature really is and why it's important. Because of that, it is flexible; it can shift to say something new to each reader, just as each hiker in a forest may discover something different. My nature poems are not just about nature but of nature. Within them lie the patterns that science and life have made over millennia. I write these poems to put the voices into language, to give words to the wordless world. I create them because I am a part of the Earth that can speak with lips and write with fingers. I send them out into the world to show people the beauty, fragility, power, and wonder of the world around us. It is my talent, my profession, and my vocation. As a scholar, I deal in facts. As an activist, I deal in issues. As a poet, I deal in feelings. And I can attest that feelings move people far more than facts or issues. Many more people make their decisions based on emotions than on logic. So if you want to convince them of something, you need to make them feel it, not just think it. If you want them to save something, make them love it, not just value it. Poetry is the language of the heart. It fills us with words that soar and fly like dragonflies above a pond in spring. It spins emotions like spider silk, sticky and shimmering. Even after a poem has been read and put away, something of it slumbers within the reader, snug as a bear in its winter cave. Every poem I write is a message of hope, of possibility, of potential. Even the dark ones are warnings of disasters that we could avoid if we choose with care. I take what the world shows me and I frame it in a way that others can easily enjoy. I send out poems like pollen on the wind, or coconuts on the ocean waves. Some of them will always find fertile ground and sprout. And the ideas that grow from them, however diverse because of the minds that bear them, will always be rooted in nature. Elizabeth Barrette lives in Illinois. She holds a Bachelor’s Degree in Rhetoric and works as a writer and editor. For more information, including how to purchase Elizabeth's books, please visit PenUltimate Productions. Every month, usually on the first Friday of the month, we post a vegan recipe. Why? Because a plant-based diet is good for the earth. If you'd like to read more about that, check out THIS POST. One of my favorite sites is The Picky Eater. The author, Anjali, posts fabulous recipes such as Channa Masala, Vegetable Paella and Ricotta & Spinach Ravioli. She also writes informative articles on interesting topics such as why we should eat slowly and items to stock in a healthy pantry. You'll find reviews of restaurants in San Francisco, Portland and Brazil. Basically, her blog is a gold mine of health and food related information ... and with so many people vowing to get healthy this year, it's a must-read! Anjali has graciously given me permission to share this recipe with you. She found it at Vegetarian Times and has included her healthy changes. It is warm and comforting ... and perfect on cold winter days. I hope you enjoy it as much as we do! 1. Toast quinoa and cumin seeds in pot over medium-high heat, 3 to 4 minutes, or until golden and fragrant, stirring constantly. Transfer to bowl. 2. Heat oil in pot; add corn, potato and shallots. Sauté 5 minutes, or until shallots are translucent. Add broth and soymilk, and bring to a boil. 3. Stir in quinoa mixture. Reduce heat to medium-low, cover and simmer 10 minutes. 4. Stir in bell pepper, cover and simmer 5 minutes, or until quinoa and vegetables are tender. 5. Remove from heat; stir in chopped cilantro. Season to taste with salt and pepper. 6. 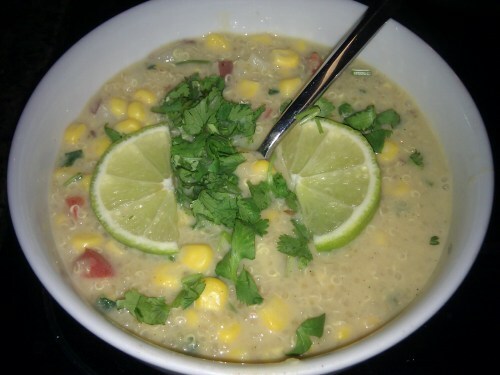 Ladle into soup bowls, and garnish with cilantro sprigs and lime wedges. Anjali served the soup with toasted pita wedges and said they were fun to use as little dippers in the soup! The original recipe, including more pictures and the nutritional information, can be found HERE. I'd like to thank Anjali for sharing this wonderful recipe with us. If you have a favorite vegan recipe which you'd like to share, please send it to me HERE. And, for the complete list of recipes we've posted, please click HERE.